BitSculptor is happy to announce that Postini, an enterprise-grade spam and virus filtering solution, is available on a per-mailbox basis to our hosting customers. BitSculptor's president Eric Schlange had this to say about the new Postini option: BitSculptor's hosting services use a variety of tools to stop spam and virus emails before they ever reach our customers, and while these tools filter out most of the spam, enough gets through that some of our customers have been asking us for a beefier spam filtering tool. I've personally tested Postini extensively on a variety of accounts, and am happy to say I'm sure our customers will be more than satisfied with the results they get with Postini. Cost for Postini is $25 per mailbox per year. No setup costs! We believe the benefits of Postini far outweight the cost, given how much time many of us spend wading through spam. If you could eliminate spam, would it be worth $2/month? We're convinced that you'll be very happy with the results of using Postini, but if you aren't, we'll gladly refund your money as long as you cancel within the first 30 days of using it. Send an email to support@bitsculptor.com or give us a call to get Postini set up on your account(s). BitSculptor recently launched LogisticLinks.com, a project for Logistic Links, Inc based in San Francisco, CA. The site features powerful tools which allow customers to easily quote and book freight to be shipped anywhere in the US and Canada. For more information on the project, view the portfolio page. 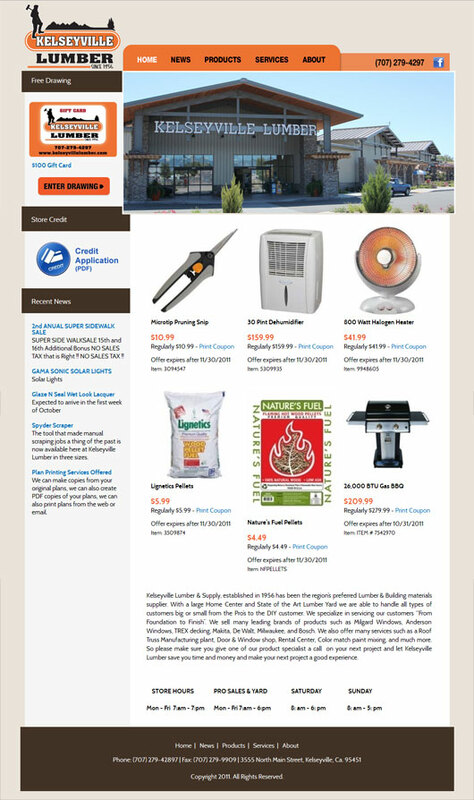 We recently completed work on a top to bottom site redesign and development for Kelseyville Lumber (www.kvlumber.com). The new site is built on the uber-powerful Expression Engine platform which gives the Kelseyville Lumber staff complete control over most of the content on the site. We also provided photography services for this project, traveling to the store and taking high quality images for use on the site and elsewhere. 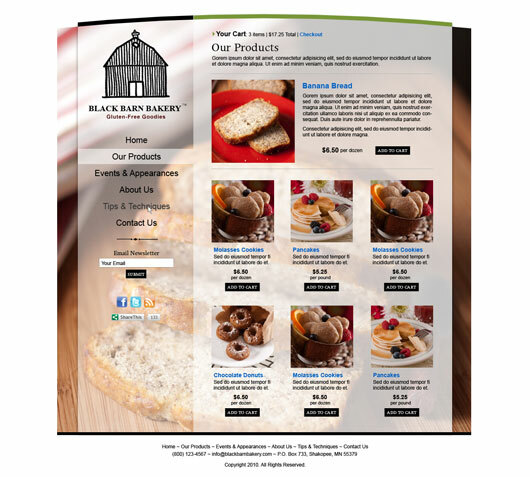 We recently took the new Black Barn Bakery website live. 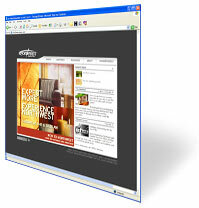 It includes e-commerce, product management and page editing capabilities. The site was built with classic ASP to speed the development process using our mountains of code built up over the years. Northwest Assembly of God (NWAOG) in Mount Prospect, IL is a growing church with a desire to inform current and potential attenders about the church's beliefs and activities. They approached BitSculptor with a desire to revamp their web site to include regularly-changing content which NWAOG could maintain easily. BitSculptor redesigned the site, then implemented myChurch tools to let NWAOG staff and volunteers maintain the calendar of events, ministry homepages, staff bios, front page graphics and text, and more. As a soup to nuts web solutions provider, BitSculptor is also hosting the NWAOG.com web site, meaning NWAOG will have one point of contact for their Internet presence needs. The City of Lakeport, California and BitSculptor are proud to announce that the CityofLakeport.com web site is now live. As a portal for the City, the site allows visitors, residents, and businesses to easily find the information they seek. 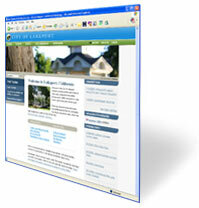 Content includes City news, events, department homepages, document archives, and much more. 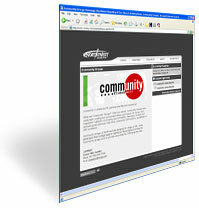 With well-organized content and simple navigation, in-depth information is at the fingertips of site visitors. The site also includes a sitewide search tool. Any site visitor can easily create a myLakeport account, which allows them to subscribe to document folders and receive news updates via email. The extensive and varied site content is maintained via a custom content management system developed in-house by BitSculptor (whose offices are located on Lakeport's historic Main Street). Various city personnel have different levels of access to the site, allowing them to maintain their content as desired. Fully designed, developed, and hosted in-house by BitSculptor, the site also includes professional photography work from our newly developed photography branch. 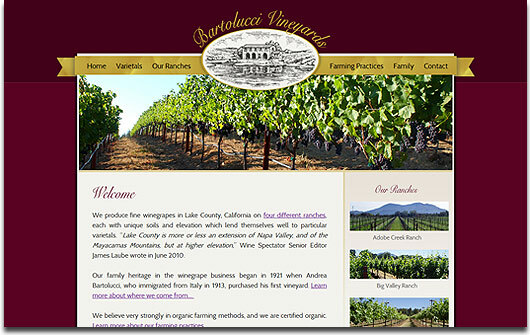 Today BitSculptor launched a new website for Bartolucci Vineyards, a local grower of fine winegrapes. Based in Lake County, California, the Bartolucci family has been in the winegrape business since 1921 when Andrea Bartolucci, who immigrated from Italy in 1913, purchased his first vineyard. Their new site was entirely designed, developed, and hosted by BitSculptor. It features a custom design coupled with fairly spartan content aimed at telling the Bartolucci story in a succint, straightforward manner. Built on the popular Wordpress platform, the site is easy to maintain and can be easy extended in the future. 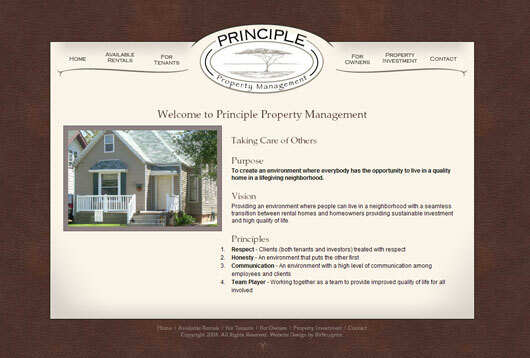 Principle Property Management, located in Peoria, IL, came to us looking for web site design and development. They wanted to be able to manage their rental listings as well as the content on the individual pages. To accomplish this, Bitsculptor implemented our proprietary web site rich text editor which allow clients to log in and manage the content on their pages using a tool very similar to Microsoft Word. We also developed backend tools enabling the Principle Property staff to manage all of their rental listings. The design was based around their existing logo and their desire to use earth tone colors. We always try to make our design solutions integrate well with company branding and the Principle Property web site was no exception. Visit the site at www.principleproperty.net. You may also view available Peoria House Rentals on the site. 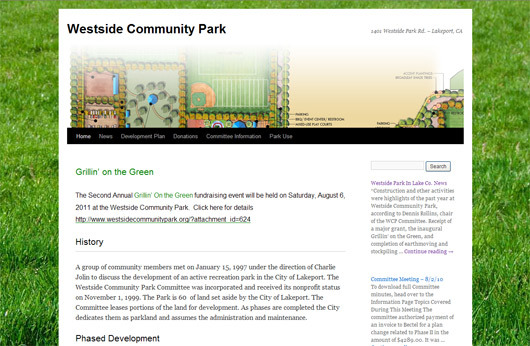 Westside Community Park is a community-driven effort to develop an active recreation park in the city of Lakeport, CA. Now some fourteen years in the making, the Park is well on its way with phased development happening and an annual fundraiser event. BitSculptor donated the development and hosting of the website as a way to give back to our local community. It's a simple website built on the Wordpress platform, and we hope it helps to in the Park Committee's efforts to complete their plans. BitSculptor has completed the development of the Wood Song Guitars web site, located at woodsongguitars.com. Built to demanding specifications with top-notch materials, Wood Song aims to offer quality guitars at bargain prices by selling direct to the consumer through their web site. With a web site as their sole storefront, a quality web presence is key to the success of Wood Song's business. BitSculptor has worked with Wood Song every step of the way to plan web site content, layout, and Internet marketing strategies. Once the plans were laid, BitSculptor's team worked over the span of several months to make them a reality. The web site features a simple yet powerful navigation structure, allowing visitors to easily browse its extensive content. E-commerce functionality is built into the site, allowing visitors to easily purchase guitars and add options to their instruments. The site also includes additional backend features like email list management, free giveaways tools, order fulfillment and processing, and a warranty registration engine.